Don't confuse our Keystone with the basic Single Frequency IR receivers sold by many others. If you have the newer HDTV DVR's, Cable and Satellite boxes many of them use a higher frequency than what has normally been found in homes in the past. This is why ours are Dual Frequency / Dual Band. Mount the Keystone IR Receiver in any standard Keystone Wall Plate. Run Cat5 cable from the receiver to the IR Block connecting block. 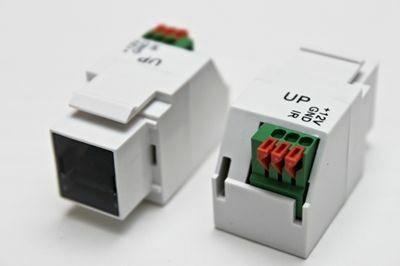 (2 twisted pairs required, shielded or unshielded). Then all you have to do is aim your remote control at this IR Receiver, which will automatically send the signal through to your devices! Special Note: These are designed to work with the IR repeaters systems that we sell. We cannot warrant or guarantee they will work with any other system so please do not try this as it could damage your system or this device. Most States require that when running cable inside walls, you must use fire rated cable such as CL-2 or CL-3. To avoid possible noise interference from induction from 115 VAC, never run low voltage and AC lines together. Installation Hint -For best appearances, mount the device at the same height as installed light switches. Room Placement:Place IR Wall Plate in direct “Line-of-Site” of the hand held remote control up to 25’ away and within a 120° of the device.